Daniel Cleary became the first Newfoundlander to hoist the Stanley Cup. These are heady days for Newfoundland and Labrador hockey. Canada's eastern-most province is celebrating native son Daniel Cleary of the Detroit Red Wings, who just became the first Newfoundlander to hoist the Stanley Cup. In January, Pascal Pelletier became the first player from Labrador City to make it to the NHL when he played six games for the Boston Bruins. The Los Angeles Kings won a bidding war late last year for the rights to Teddy Purcell, an undrafted native of St. John's, Newfoundland, who had helped the University of Maine reach the NCAA Frozen Four in 2006-07 and was named Hockey East Rookie of the Year. This past season, Purcell finished third in the American Hockey League with 83 points and was fourth with 58 assists. He won the Dudley (Red) Garrett Memorial Award as the AHL's outstanding rookie, made the AHL's All-Rookie team and was a first-team AHL All-Star. He also got in 10 NHL games with the Kings, registering a goal, two assists and a plus-10 rating. Cleary, of Carbonear, had 20 goals and 22 assists for 42 points to rank as the top scorer among the six Newfoundlanders who played in the NHL this past season. Bonavista's Michael Ryder of the Montreal Canadiens had 14 goals and 17 assists. San Jose Sharks forward Ryan Clowe, of Fermeuse, had eight points in 15 games, while Jason King, of Corner Brook, was scoreless in four games for the Anaheim Ducks. Cleary is the hero of Newfoundland this summer, a talented prospect who left the island at age 16 to star in the Ontario Hockey League and was chosen by the Chicago Blackhawks with the 13th overall pick in the 1997 Entry Draft. But his story from that point is illustrative of the problem Newfoundland hockey players have faced. Cleary was traded to Edmonton, played four years there, signed as a free agent with the Phoenix Coyotes and was cut after one disappointing season. At the urging of his agent, as well as former Oilers teammate Shawn Horcoff, Cleary underwent a rigorous summer training routine and played the lockout year with Horcoff in Sweden. The Red Wings gave him a tryout the following season and he's had three steadily improving seasons, culminating in the 2008 Stanley Cup. "What have you heard about Newfoundland hockey players?" challenged Nelson White, the former NHL Central Scouting Service scout in Newfoundland who has been involved for many years in Newfoundland hockey. White was told the rap was they weren't very good skaters and often lagged in conditioning. "And a few with alcohol problems," White said. "A lot of players who had a chance squandered it, many of them happy to just come back home and play senior hockey. The rap was Newfoundlanders came to NHL training camps out of shape after a summer of just hanging out. Our guys seemed happy to make it, but didn't want to work hard enough to stay there." But that's just one of the reasons Newfoundland and Labrador haven't produced many NHL players. Newfoundland didn't become part of Canada until 1949 and didn't have the hockey tradition that existed across the country, even in the other Maritime provinces. Howie Meeker is given great credit for raising the quality of hockey in Newfoundland. After winning four Stanley Cups with the Toronto Maple Leafs, he briefly became coach and general manager. After getting fired in Toronto, Meeker accepted an offer to play senior hockey in St. John's. He remained in Newfoundland until the 1970s, playing and coaching. It was in Newfoundland that he began producing his long-running series of hockey instructional videos that ran on Canadian television and led to his joining the Hockey Night In Canada broadcasts. "Howie had a lot to do with improving Newfoundland hockey," White said. "He coached high school teams and minor-hockey clubs. He was very influential." Meeker "discovered" Newfoundland's first top hockey player, Alex Faulkner. After watching Faulkner star against one of his teams, Meeker called Maple Leafs Assistant General Manager King Clancy and recommended a tryout. The Maple Leafs signed him and sent him to the AHL. Faulkner played only one game for Toronto before they released him. He then signed with Detroit, played 70 games and had 10 goals and 10 assists in 1962-63. 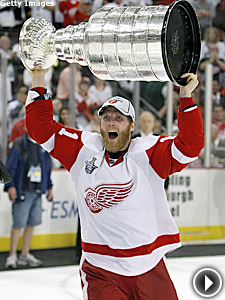 He had five goals in eight Stanley Cup games that year as Detroit fell to Toronto in the Final. Within a year, Faulkner had become both the first Newfoundlander to play in the NHL and the first to play in the Stanley Cup Final. He played 30 games with Detroit the next year before returning to the minors. He finished his professional career with four seasons in the Western Hockey League with the San Diego Gulls. Darren Langdon had been the most successful Newfoundlander to play in the NHL before Cleary, who passed Langdon's mark of 521 NHL games earlier this season. Langdon, from Deer Lake, played for the New York Rangers, Carolina Hurricanes, Vancouver Canucks, Montreal Canadiens and New Jersey Devils. Langdon was 21 when he made his pro debut with the Dayton Bombers of the ECHL in 1992, drawing attention to himself with 429 penalty minutes. "For a long time, Newfoundland players just didn't go away," White said. "Now they see the Quebec Major Junior Hockey League and the NCAA as a viable option. The talent was always here, I just think there is more opportunity now. Give you an example: Andy Sullivan is a legend around here, a very fine senior-league hockey player for many years who joined the St. John's Maple Leafs when they had the AHL team here. He didn't play pro until he was 32 and he didn't embarrass himself. "Senior hockey was the biggest form of entertainment in Newfoundland and it's still popular. They don't draw as well anymore during the regular season but they sell out Mile One Arena for the playoffs." Sullivan, born in 1961, stayed home, whereas a couple of Newfoundlanders born in the 1970s went elsewhere to play in their teen years, starting a trend. "Since John Slaney went to play juniors with the Cornwall Royals, we've developed a lot of players who left to play Canadian juniors," White said. "Terry Ryan is a few years younger than John and he went to the Western Hockey League and became the highest drafted player from Newfoundland when the Montreal Canadiens picked him No. 8 in the 1995 NHL Entry Draft. "Since then, we've seen Dan Ryder go to Peterborough, Mike Ryder go to Hull, Jason King played at Halifax, Darren Langdon played Maritime Junior A and Dan LaCosta played at Barrie." "In recent years, I think there has been better coaching and easier access to opportunities and there are more Quebec league scouts here looking for players," White said. But the window of opportunity, if not closing, may be getting cloudier. 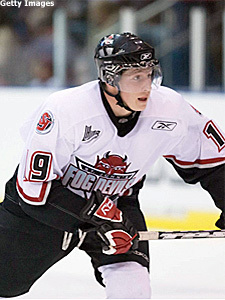 The St. John's Fog Devils of the QMJHL operated from 2005-08, but announced they have transferred the team to the Montreal suburb of Verdun. That will result in less opportunity for Newfoundland players, White said. Luke Adam is expected to be the highest-drafted Newfoundland player this year. "Before the Quebec league, a Newfoundlander could declare which junior league they wanted to play in," White said. "When the Fog Devils were here, they had first pick of the players under territorial rules. Where a Newfoundland player plays now is up for grabs and hasn't been clarified yet. The Canadian Hockey League will have to make that decision. "But there 15 Newfoundlanders whose rights belonged to the Fog Devils. If they weren't on the junior team roster, they played Midget AAA. I think there are another eight Newfoundland players on Quebec league rosters and two in the Ontario league." White said the change probably won't affect a couple of young players who are making strong progress. "Nicolas Champion, the goalie for Acadie-Bathurst, is draft-eligible this year," White said. "He has a good foundation because he played goal for (Midget AAA) Labrador City, a weak team, and saw lots and lots of shots. He was only a 12th-round pick in the QMJHL draft but he became the starter due to injuries and took them to the playoffs. "Andrew Sweetland, who set scoring records with the Amherst, Nova Scotia, Ramblers and was the University of Maine's top rookie last season, signed with the Florida Panthers after his college season ended." Sweetland, the Ryder brothers and Adam Pardy, who was drafted by the Calgary Flames a few years ago and is in the AHL now, are cousins. Luke Adam is expected to be the highest-drafted Newfoundland player this year. Adam's father, Russ, played with the Toronto Maple Leafs and then finished his career in Newfoundland's senior league. He was an assistant coach with the AHL's St. John's Maple Leafs and has coached his son and other minor-hockey players in recent years. Adam is the No. 42-ranked North American skater for the 2008 NHL Entry Draft. It's unlikely he'll top Ryan's No. 8 overall selection, but he does look like a player with an NHL future.